BRIEF SYNOPSIS:: The story of Marakand continues, as the grip of the titular Lady upon Marakand is challenged from within and without. PROS: Fascinating world building; real epic storytelling feel to landscapes, characters, backstory and history; beautiful cover art. CONS: The ungainly split makes for a rough singular reading experience in both volumes. BOTTOM LINE: Deep, epic storytelling in a fascinating world that is marred by its split and format. There is a world in fantasy steeped in its history and myth. A world where the Old Gods have withdrawn, and seven devils, long ago imprisoned and bound, have sought to work their way free to dominate the world of local gods and Men. A world of cultures and societies inspired by Central Asia, the Russian Steppes, and Siberia. From the lost kingdom of Tipyur in the West, through to Nabban and the forest kingdoms over Malagru in the east. Along the trading highway, where the Malagru mountains meet the Pillars of the Sky, there is a great city. A city where three Gods once ruled, but now one, with a dark secret, is ascendant. A Goddess, The Lady, whose rule over the City, and the lands around, is challenged, even as she tightens her grip. The Lady is the second half of Marakand, a fantasy epic by K.V. Johansen. Marakand is ungainly split between two volumes: The Leopard and The Lady. In my discussion of The Leopard, I discussed the basic lines of the book, which continue here. The Lady continues to tighten her grip on the city, even as opponents and foes slip through her fingers and she wars even within herself about what to do. Characters seemingly dropped early in The Leopard do return, and the narrative as a whole weaves together toward a satisfying conclusion. As a whole, and taken together, Marakand’s story is a beat in a long running history of which we are only seeing a part. The Blackdog was the first novel length entry into this world. That novel, much more of an adventure fantasy, can now be seen in hindsight as part of an arc of this era of the world, as the Seven Devils, long held and bound, seem to be working free again, to war against each other, against man, and against the Gods themselves. Have you read Tolkien’s The Silmarillion? That volume, often in summary form or in fragments, tells a series of stories and myths that form the backstory to The Hobbit and The Lord of the Rings. Some of the book is summary narrative, others are pieces of stories that Tolkien never finished. The pieces, though, form a long-running story of the rise and fall of the Elves and the ascendancy of Man, shot through the struggle against Evil. The stories and fragments, however independent, push forward these narratives. Although Marakand is, plot-wise, independent of The Blackdog (although events of it are referenced), it is thematically the next step in what appears to be in Johansen’s own Silmarillion-like history of devils, Great Old Gods, local gods, and the story of men in her world. The end of the novel, too, makes it clear that events, like in Blackdog before it, will roll on and push forward the world’s history. The epilogue, which pulls us back to a storyteller’s perspective of the entirety of the myth, makes this arrangement of the narratives clear. Again, though, the decision to split this novel into two parts is a decision that hurts the book grievously. Together, the volumes are about 900 pages of reading, which is on the long side for an epic fantasy novel, although there are books even longer by Erikson, Martin, and Sanderson. It is unfair for a reader to have to shell out twice to get both halves of the novel, and the split diminishes the reading experience. These two books are best read together, back to back, as one unbroken narrative. 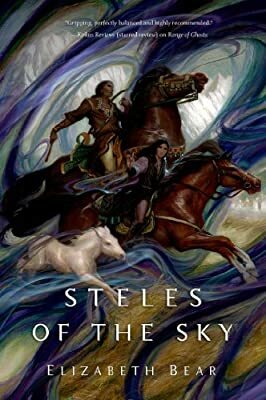 Johansen thankfully does include a glossary at the beginning of the second book to get people up to speed on who’s who in this story, but reading two halves of a complex, complicated epic fantasy months apart dilutes the experience. Johansen, though, writes the kind of Silk Road Fantasy that I love to read. She also writes with that medieval-infused epic deep history strand of Tolkien that few authors have drawn from. Many authors have employed the surface trappings of Tolkien. Johansen has taken the deep mythic history and infused it with landscapes and cultures that are finally getting the attention that they deserve. I’d love to see the Silmarillion for this world one day. In the meantime, I will happily and gladly read more novels set within Marakand. I just hope they aren’t split into singly incomplete parts as this one was.